Yesterday, H&F Council released the latest papers for the Planning Applications Committee (PAC) due to meet on Wednesday 23rd September 2009. Nobody I spoke to is surprised by the view expressed in the report. One resident told me that it is widely believed that the Administration’s decision to back the property speculator’s proposal had been made long ago. But, given the evidence, I am still astonished to see the words written on page 10 urging committee members to “resolve” to go ahead and “grant permission” for the highly controversial over sized buildings when they meet next week. The development (especially the big block) is too dense for the site and fails to meet H&F Council’s own guidelines about amenity space. The proposed buildings will overlook many of the surrounding homes and gardens breaching H&F Council’s own Unitary Development Plan. One hundred and eighty two local jobs will be lost as businesses such as Innocent Drinks, The Soundhouse Studios and others are forced to move out. There will be extra traffic and noise as the site is opened up to 24/7 usage. The development fails to provide parking for visitors, thus further adding to parking stress for neighbouring residents. Brackenbury School, adjacent to the site, is already over-subscribed and will be unable to accommodate the extra children. Many local people have expressed concern about the Conservative Administration's lack of even-handedness pointing out that it has been in private discussions with the developer for almost two years. Our council then accepted payment from London & Newcastle for an advertisement in its widely circulated propaganda sheet and had the Council’s press office publish a positive story about the scheme while refusing to publish any residents’ letters that offered an alternative view. Add in our Conservative councillors publicly funded trips to the French Riviera - which the Council explained was so they could meet property speculators to discuss "contentious" sites across the borough; then take a look at this video to witness the shifty uneasiness the Tories obviously felt while responding to residents’ questions on a different scheme and it's understandable why residents feel their legitimate concerns are not a priority for H&F's Tory run Council. In fact, the Tories had actually sought to send the application to the PAC on 5th August – knowing that hundreds of local people had objected to the scheme but that many would be away on holiday and unable to attend. They almost certainly did this to limit any public demonstration. That plot was only scuppered when the Environment Agency called in the application because of concerns about flooding. So, next week’s PAC promises to be interesting. Residents wanting to turn up to protest against this blot on the Hammersmith landscape should turn up to the Town Hall in King Street. 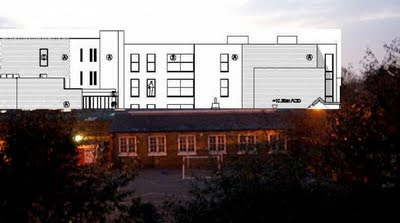 The meeting will begin at 7.00pm and the Goldhawk Industrial Estate is the first item on the agenda. I shall see you there. If this development goes through Innocent Drinks will have to leave, as will the Soundhouse, a top recording studio, and Analox, another small and thriving enterprise. So it's not just local residents who will be affected - there's 182 jobs at stake. Can I suggest someone do a little digging on the developers at companies house. Also worth putting in a freedom of information request to the council to find out how many times they have met privately with the developers and whether minutes were kept of those meetings. This reminds me of how the council dealt with the development of the old builders yard behind Percy Rd. They held private discussions with the developers, made up their minds in advance and railroaded local opinion which was unanimous in its opposition. 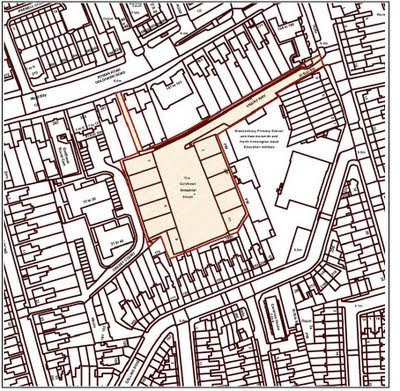 The development is far too dense, overlooks the other existing houses and is set to cause real problems with parking. It's already difficult to find place to park in percy rd in the evening or at weekends and they haven't even been sold yet. Furthermore the developer is now seeking to make it even denser by putting in new planning applications to make the house bigger. Hoping to wear down local residents who have fought this development for many years. We checked up on the developers at Company House and found out they are registered in the British Virgin Islands. 'My own personal association is with the Soundhouse, where I have been recording programmes ever since it came into existence more than twenty years ago. It is a classic example of a small business that has grown to maturity in the area where it was born. It meets local needs as well as bringing in both national and international clients, thus enhancing the status of Hammersmith. He concludes by saying that he is wholly opposed to this development. The Planning meeting is tomorrow (Wed, 23 Sept), 7.00pm at the Town Hall.